School Room Dividers Cut Distractions! 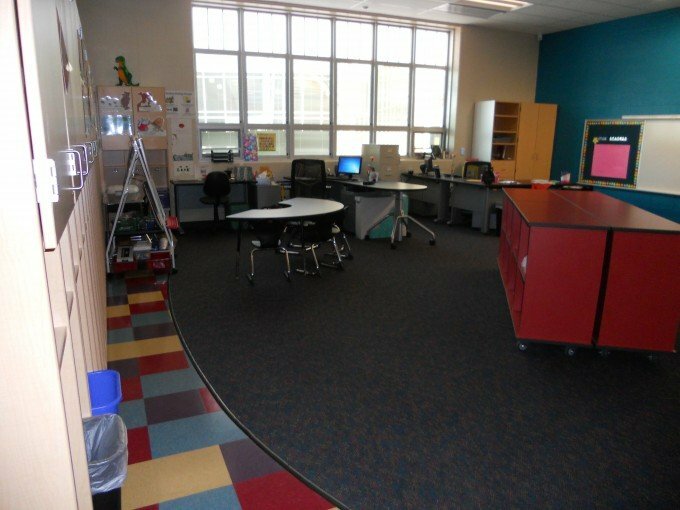 Thank you Otsego Elementary for sending these great before and after photos demonstrating how room dividers work in your classroom! One 6′ high 13-panel room divider divides this classroom into two so that two teachers can share the same space without distractions. Take a look at the photos below. School Room Dividers work great to split a classroom into two groups. In this situation, two teachers share a classroom and it was very distracting for both the students and teachers. Now teachers can open the divider which is 6′ tall and 24′-1″ wide and divide the class into two math and reading levels. Two teachers found it distracting while trying to teach two groups in the one classroom. Only one low shelving unit separated the groups. One 6′ high by 24′ wide room divider divides the space in this classroom to create two areas for learning. Distractions and sound lessen when the divider is open. Room Divider panels are the perfect spot for pinning teaching materials, artwork or a hanging a marker board for writing. Acoustical panels absorb sound and help to keep distractions out. 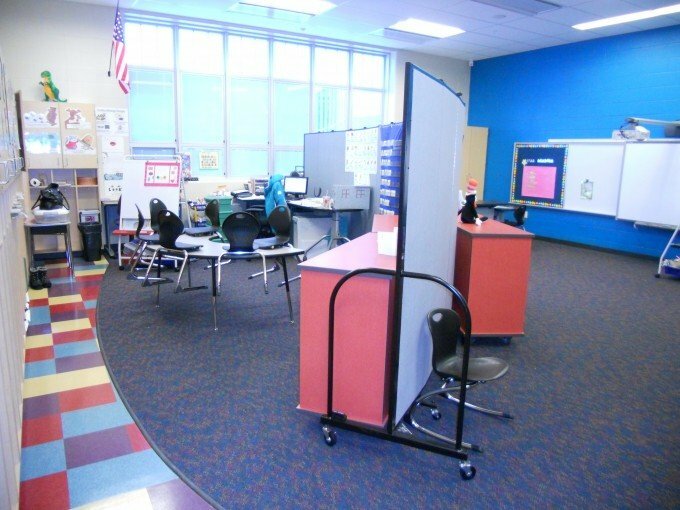 When teachers want to return the classroom to normal, they simply fold the divider up and store in a small space in the corner of the room. We needed the divider because another intervention teacher and myself are sharing a classroom this year in our brand new school. The only thing dividing us was two low red bookshelves. It was very distracting. We very much like the divider because it helps with the distractions of seeing the other students coming and going. It doesn’t totally stop the sound but it sure helps. On my side of the room, I have plenty of cabinets but I had no bulletin board area. I love the space to put up my phonics wall and letters. I was able to move them easily and set it up immediately. It is a great help. I love the fact that it can be my bulletin board since I am on the side of the room that has the student cupboards and not any bulletin board space. The color is great too. Are My Room Dividers Safe For My Classroom? Room Dividers Cut Distractions At Flat Stanley's Dress Rehearsal!